The great enemy of truth is very often not the lie – deliberate, contrived and dishonest – but the myth – persistent, persuasive and unrealistic. Too often we hold fast to the cliches of our forebears. We subject all facts to a prefabricated set of interpretations. We enjoy the comfort of opinion without the discomfort of thought’. John F. Kennedy 1962. One of the great legends of the canary world is that the Lizard canary and the London Fancy (or at least a common ancestor, the Fine Spangled Sort) were brought to England by the Huguenot silk weavers following the Renunciation of the Edict of Nantes in 1685. You will find it repeated as ‘fact’ in books, articles, and the internet; a mantra that people chant without question. It is a classic example of Kennedy’s ‘comfort of opinion’; it has been repeated so often that people assume it must be true. But is it? In this chapter, I am going to subject the legend to the ‘discomfort of thought’. What Blakston has done here is to look at London in the early part of the eighteenth century and picked out five ingredients (the French, Huguenots, refugees, silk weavers and canaries) and combined them into a plausible theory. Unfortunately, when you look at his theory in the wider context, it seems less credible. Those same ‘ingredients’ were present in many countries, but they didn’t result in the Fine Spangled Sort, let alone the London Fancy or the Lizard canary. Germany and Holland, in particular, were more advanced than England when it came to canary culture. If anybody could establish a distinct variety, surely it would have been them? Why was the Fine Spangled Sort recorded only in London which had less than 11% of all the refugees, and less then 3% of all Huguenots? Another discomfort: why should we assume that the Huguenots had a monopoly of canary culture in France? They didn’t. The French bird trade was controlled by the oiseleurs (3), a guild of bird catchers and sellers authorised by the King, and therefore predominantly, if not entirely, a Catholic institution. The population of France before the dragonnades consisted of around 20 million Catholics and almost 800,000 Protestants (4). Are we really to believe that the Huguenots, with just 4% of the population, possessed all the Fine Spangled Sort and took them all to England? Of course not, but that begs the question: what happened to the canaries that stayed at home? The next discomfort is that the image of desperate refugees clutching cages of canaries as they crossed the English Channel may have a romantic appeal, but it is almost certainly a myth. As we saw in part 3 of this series, any attempt to leave France was fraught with danger. 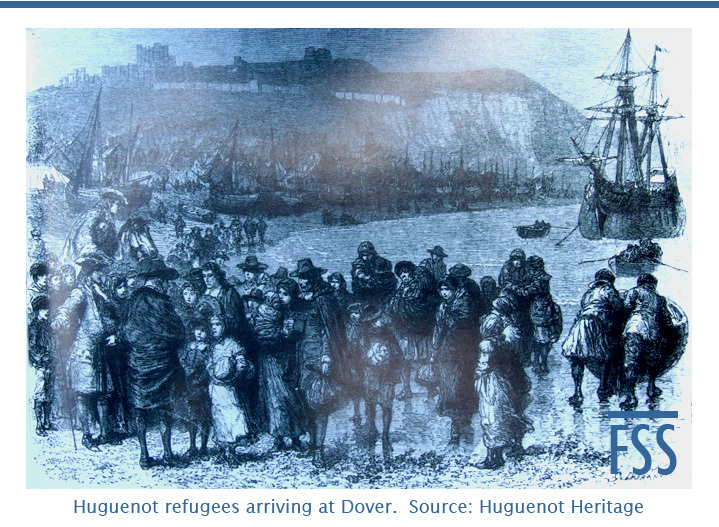 The borders were closed, there were patrols, spies and informants who were well rewarded if they helped the authorities to catch Huguenot émigrés. The escape routes entailed hidden tracks, mountain passes, or night time rendezvous with ships. It was essential that refugees travelled light. Canaries would not just have been an encumbrance, but potentially a fatal one. The final discomfort (at least for now) is that on arrival in a strange land where they did not speak the language, a refugee’s priorities would have been those of survival: finding food and shelter; tracing friends and other members of their families; finding work and making a living. Canaries would have been a luxury that they could only contemplate when they were settled. The more you think about it, the less credible the legend becomes. In my opinion it has survived because, in President Kennedy’s words, too often we hold fast to the cliches of our forebears . . . We enjoy the comfort of opinion without the discomfort of thought. Penates were Roman gods of the household. W. Blakston Canaries and Cage Birds (1878-81), p.175. I will write more about the oiseleurs in a future article. Philip Benedict The Huguenot Population of France 1610-1685 (1991), p.9. For anyone wishing to learn more about the Huguenots, I recommend Robin Gwynn’s Huguenot Heritage. Easily the best introduction to the subject: well researched, wide-ranging, and very readable.